Elsa and Jasmine travel out with their boyfriends take different destinations. Jasmine choose a tropical beach atmosphere helps to dress her and her boyfriend for a fun day of beach, a selfie for memories are made. 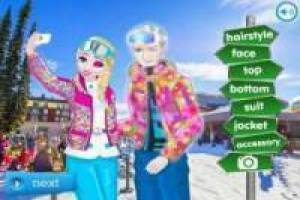 At the other end Elsa goes with her boyfriend, they choose the winter go skiing, dress them in the garb they need to withstand low temperatures, including a selfie are also made for your photo album. What these two lovebirds not know is that these photos will go to the vote being only one as the winner. Have fun with these couples choosing dazzling outfits. 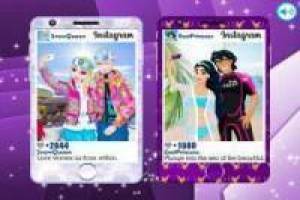 Enjoy the game Selfie fun of Elsa and Jasmine with their partners, it's free, it's one of our disney princesses games we've selected.